Configure Price and Quotation (CPQ) software is front and centre in the digitisation of the selling and buying processes. Even though the selling transaction has undergone considerable disruption, for too many people, perceptions about selling remain unchanged. Instead of starting the day slipping behind the wheel, today’s sales rep is likely slipping into an ergonomic posture chair and firing up a PC or tablet. Prospects and opportunities are not going to be found cruising around country looking for big buildings with smoke stacks. Today, those opportunities are found by building smart queries and digging through millions of bytes of data looking for specific matches. CPQ systems contain troves of data related to products, including specifications, pricing and product usage parameters dictated by environment, regulation, budget or preference. Additionally, CRM systems and order management systems contain customer data that include, not only the choices they made within CPQ, install dates and locations, but also their marketing demographic data. Combining this data provides the grist for the business intelligence (BI) analytical engines to sort, parse and manipulate it into actionable information. A few simple queries within the CPQ software can provide prospecting lists ripe with opportunity. Here’s an example. These three queries provide the sales rep with a list of prospects running older versions of product X. These customers should be interested in the latest version of product X that does so many wonderful things that their old version doesn’t do. That’s a very simple example of how product information and customer information can power the sales prospecting process and transaction. But it’s not just for prospecting. BI is useful to the consultative sales rep, as well. Consider the sales rep talking to an existing customer who has a system to convey liquids within a manufacturing facility that makes cleaning compounds. They use a line of pumps and valves offered by the sales rep’s company. Of late, this customer has an opportunity to take on a new client who is looking to them to provide a new type of solvent used in removing paint and finishes from metal surfaces. The question is, will the sales rep’s pumps and valves stand up to the effects of moving the new solvent through the manufacturing process? Our consultative sales rep has a challenge. He can ask his engineers if this material will damage their products. The engineers may even green light the deal, but the customer may want something more than an engineering opinion. CPQ contains the data related to specifications and usage limits for all products, specifying the exact product needed and then running a query to determine what existing customers are using that product will deliver a list of credible references using the product under conditions required by the prospect. The prospect can obtain the assurances they need to move ahead with the purchase. Sales strategy, configuration history, customer data and marketing objectives are all digitised into specific values. Combining that data with intelligent queries turns it into actionable information. 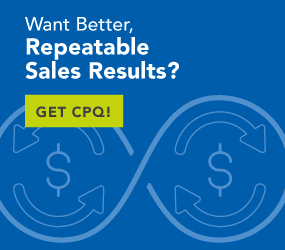 CPQ is the tool used by Sales to apply that information and leverage it into sales opportunities.